Krauth, William C (March 1, 2018). Beloved husband of Theresa J. (nee Integlia). Loving father to William C. Jr., Jason C., and the late Michael A. Krauth. He will also be missed by his four grandchildren Amanda E., Tara A., Brandon M., and Alyssa M. Krauth as well as many family and friends. Bill graduated from Germantown Academy in 1962 and furthered his education at Bucknell University. Before Retirement, “Mr. 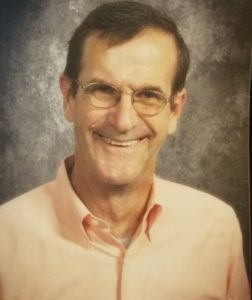 Bill” loved his work as a Custodian within the Springfield Township School District. In his leisure time, Bill enjoyed spending time outside, fishing, and watching a variety of sports. Relatives and friends are invited to Bill’s Memorial Service Thursday, 3/8, 11:30 a.m. at The Flourtown Country Club. Where there will be a visitation starting at 9 a.m. Family and friends are asked to wear their favorite Philadelphia Sports attire (e.g. Jerseys, Hat). Interment Private. In lieu of flowers contributions in Bill’s name may be made to Shane Halligan Memorial Fund, c/o The Halligan family, 301 Integrity Ave. Oreland, PA 19075 or Springfield Lacrosse Parents Association 611 Arlingham Rd, Flourtown, Pa 19031. We send our love to your family. We will miss Bill and are glad we knew him and your family for all these years. May you all find peace knowing he was so loved. The Polis and Riley families. Our deepest condolences to the Krauth Family. We’re thinking of you and wishing you much peace and hope. May Revelation 21:3 & 4 and Isaiah 25:8 reassurance be as uplifting to you as it has been to us filling each day with much comfort and hope.